The life story of 80'ies Austrian superstar Falco, the man behind the monster hit "Rock me, Amadeus". The story of Johann "Falco" Hölzel from young kid, the road from a band to his solo career, and to his tragic death. It's hard for me to tell whether this film is good or not. I didn't like it. To say it more accurately: I really suffered this one and a half hours in my cushioned seat. First, and this one is easy: It is the worst austrian movie of the past ten years I've seen. Haders performance is far behind his possibilities, and Dueringer... well, I don't like him. He's not acting, he's playing himself. I liked 'Hinterholz 8', but I can't see anymore of his performances, because it's always the same person, without any changes - there's no acting. The worst part of this 'experience' was, that everyone in the theather was expecting comedy. And it surely wasn't. There have been a few good jokes, the rest was death-scaring serious. But many guys sitting next to me didn't get this, and they laughed the whole way through. I think it's the advertisments fault, which made us believe that this is a funny movie. Who knows, with a more serious, more quiet auditorium I might've been able to enjoy this film. But that's not the only point. 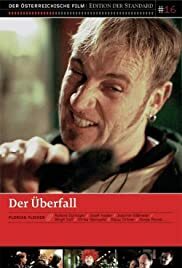 'Der Ueberfall' has boring scenes with absolute no message (I think so, 'cause I didn't find any), and more than once I thought about leaving the theather before gettin' real angry 'bout myself, because that was such a waste of time. To say it again, maybe I would have liked it more with no idiots laughing loudly during scenes, in which düringer beats his hostages or gets punched bloody just minutes later. It was the 'Three Kings' effect: There everybody expected comedy and saw a hard, rude war movie - stuff to think about. But there the audience checked this, and after about thirty minutes of 'reorganization' I was able to see 'Three Kings' in the right manner. At 'der Ueberfall' this was impossible. Maybe I will see him once more - alone and in front of my tube, and maybe I'm gonna repeal my opinion then. For now: Don't waste your money, go and see 'Indien', 'Wanted' or even 'Hinterholz 8' on video, if you want to see good austrian stuff. Because those are good, 'der Ueberfall' isn't.